R. S. Sundar (C), the director of Kudankulam nuclear power plant was given the "order of friendship". 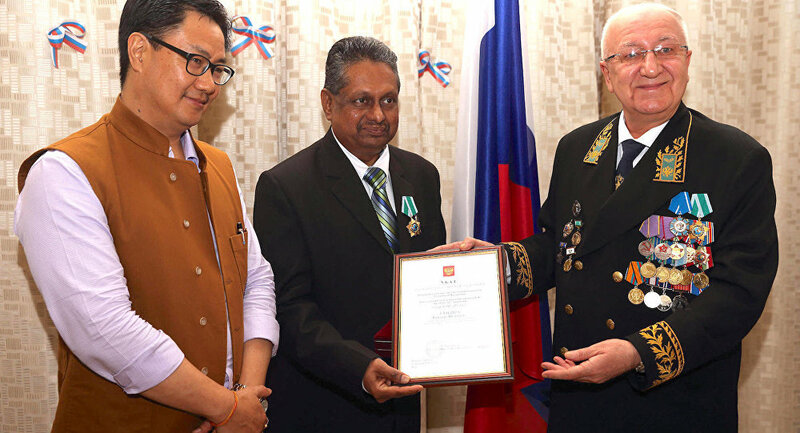 R. S. Sundar was given the "order of friendship" for his role in the operations of the nuclear facility. Russia has bestowed a top honor on R. S. Sundar, the director of Kudankulam nuclear power plant in India as a sign of strengthening ties. Sundar was given the "order of friendship" for his role in the operations of the nuclear facility. He was given the award by Russian envoy Alexander Kadakin during an event at the Russian diplomatic mission in the Indian capital New Delhi. ​Speaking to Sputnik after receiving the award, an elated Sundar said: "It was a really great honor. It was entirely a team effort. Though I'm receiving the honor as a representative, it was largely the teamwork of all our employees. Credit is due to both the Indian side and the Russian side. It would not have been possible to implement such a huge project except for the cooperation extended by everybody." When asked about the difficulties in pursuing the venture, he said: "We had our technical challenges but we overcame all those carefully. After all, all of us are professionals so it was not be difficult to overcome the technical challenges. Though everybody can have an opinion it will not affect our project at all." Sundar admitted that though there are some "slight delays" in the functions of the nuclear facility, he expressed confidence that the overall shape of the project has not been affected much. Sundar's honorary decree was signed by President Vladimir Putin. Hailing the collaboration between the two countries, Russian ambassador Kadakin said on the occasion: "The construction process of new blocks at the Kudankulam site is progressing in accordance with the perspective plan of Russian-Indian cooperation in the field of nuclear energy. Unit 2 of the KNPP [Kudankulam Nuclear Power Plant] is ready to produce electricity and will be connected to the national grid in a few days."